Carers NZ surveys indicate that many of New Zealand’s family carers have diabetes, or support someone who do. If this is the case for you, Diabetes NZ and your local diabetes service want to help you build confidence, and provide back-up and support as you learn how to live well with diabetes. Visit the Diabetes NZ website for information about Type 1 diabetes, Type 2 diabetes, gestational diabetes, and how to live with diabetes. The site includes advice about food and nutrition, medication, sexual health, and many other topics of interest to those who have diabetes and their families. 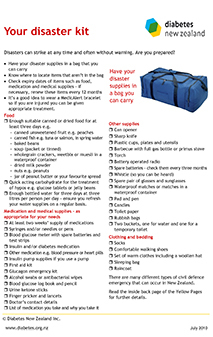 We like the Diabetes NZ Disaster Kit, with lots of tips to prepare for an emergency. People who have diabetes need to be especially prepared for the unexpected, as they need appropriate food, medication and other supplies to manage their condition if they need to leave home suddenly. At the website you can also learn about Diabetes NZ’s magazine, and download articles from past issues. You’ll find subscription details at the site. Listen to Ann Privet of the Pharmacy Guild talking about support and services available from your local pharmacist and how to manage medications at home.